These are the last two small leftover blocks. You can get all the extra blocks and the instructions for assembling the quilt by requesting them here. (contact page). Many farmers say that our fields are the best anywhere for growing big stones. Makes for lots of pretty stone fences though. For anyone who would like to purchase the full quilt pattern, all eight shops from the hop and this web site will have it in the next week or so. Please send these extra. Blocks as well. Thanks again. Thanks! I always have fun with the hoppers! 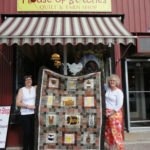 Thanks to everyone who organized, prepared fabrics, drove all over to make sure so many quilters had a wonderful day. And thanks to all the “hoppers” for making this so much fun to do! Leave a Reply to Joanne Villeneuve Click here to cancel reply.